So a few weeks back my boys were over for the weekend. I had stolen the PS3 controller from my younger son and was looking for something other than the Hunter x Hunter marathon he was planning (he has been watching it, but I haven’t). I started the first episode of Tigermask (as a bit of a joke), had a laugh, but quickly gave it up. Then I decided to (also as a joke on him) play an episode of Heybot. First impressions are sometimes on the nose. We got over halfway through the first episode, then decided his older brother needed to watch it as well. So we called him in and restarted the episode. His reaction was much the same. “It’s as if someone did a bunch of cocaine and hallucinogens and then decided to make a show” was his description. I wasn’t going to argue this. Heybot is, I guess, a show aimed at a younger audience. 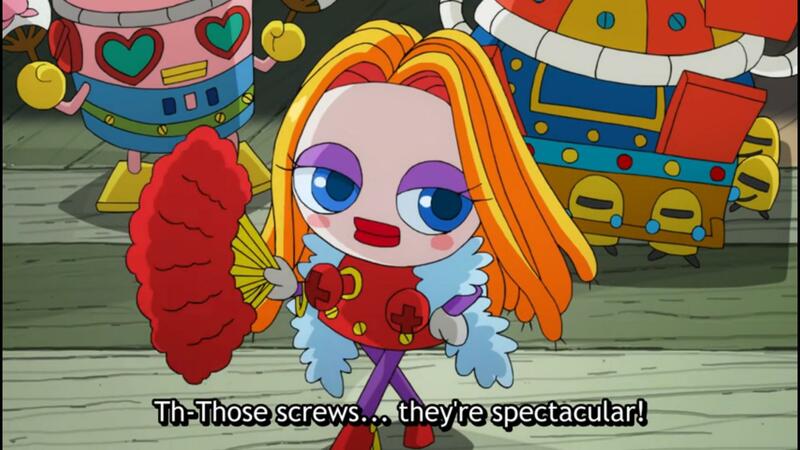 The show takes place on the fictional island of Nejigajima and follows the Prince of this island and his robot (Heybot). They collect screws to use to compete in battles to tell the best joke. The island is all about these screws. The Prince is creepily obsessed with screws. No, really. He creeps out other characters with his obsession. The humor is fast paced, often juvenile, random, and occasionally clever. They do like to mess about with anime tropes on a regular basis. Not in a subtle way mind you. The humor does work. Often in a very confused what-the-hell sort of way, but it does get a chuckle. The animation is nothing to write home about. It’s kid’s show style of animation. It is not bad for what it is and fits the format well. Attention Parents: Mostly the show is harmless. There is some sexual suggestiveness in parts and bad body humor. Maybe? My son now likes it (or at least watches it for the weird factor). I have gotten laughs out of it. Give it a try if you want to watch an off-beat, random show.